TEN was in front across a 2 hour chunk of Monday night viewing thanks to MasterChef and Have You Been Paying Attention? MasterChef Australia pulled 850,000 viewers, down on last week’s 895,000, but still ahead of House Rules on 786,000 and Talkin’ ‘Bout Your Generation on 686,000 -Nine’s comedy was up by a cool 91,000. TEN also topped 2 demos. HYBPA? also won with 753,000 over Four Corners, Big Bang and The Mentor, and won 16-39 demos. But it was Seven than won the night, bolstered by wins with Seven News and The Chase with House Rules shadowing MasterChef. A Current Affair enjoyed a small lift, up from 859,000 last week to 887,000 . 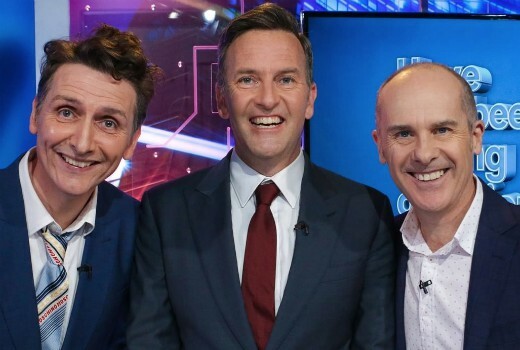 Seven network won Monday with 27.8% then Nine 26.2%, TEN 21.4%, ABC 17.8% and SBS 6.9%. Seven News was #1 for Seven with 1.11m / 1.03m then House Rules (786,000), Home and Away (690,000), The Chase (686,000 / 422,000) and The Mentor (416,000). Gordon Behind Bars drew 193,000. Nine News (1.06m / 979,000) led for Nine followed by A Current Affair (887,000), Talkin’ ‘Bout Your Generation (686,000), Hot Seat (602,000 / 342,000), The Big Bang Theory (490,000 / 382,000). Footy Classified was 161,000 in 3 cities and 100% Footy was 95,000 in 2 cities. MasterChef Australia (850,000) and Have You Been Paying Attention? (753,000) both won their slots for TEN. The Project was 590,000 / 373,000, TEN Eyewitness News was 505,000 and Family Feud drew 326,000. A Graham Norton Show replay plugging a late Roseanne absence drew 259,000. ABC News (737,000), Four Corners (639,000), Australian Story (623,000), 7:30 (622,000), Media Watch (581,000), Q&A (401,000) and Think Tank (261,000) comprised ABC’s night. On SBS it was Elizabeth (261,000), Michael Mosley: The Superbugs (197,000), 24 Hours in Emergency (192,000) and SBS World News (152,000). ABC KIDS’ Fireman Sam topped multichannels with 193,000. Love Island drew 162,000. Talking Footy was 96,000 in 3 cities. Even Sam Pang pulled him up on his gurning to the camera. Gave this show a second try last week, urged on by a family member. Nope, still juvenile and a platform for smart-alecs.